Opens the heart chakra and stimulates cleansing in the mental body. Supports children through periods of change, helping to expand understanding. Stimulates the brow chakra encouraging greater spiritual and psychic sensitivity. To release defence mechanisms built up around aura by the ego, i.e. spikes, armour. Helps bring artistic, spiritual and scientific concepts into consciousness. 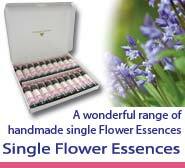 Amplifies other flower essences. Helps attunement to past & future lives. Helps the development of a Spiritual understanding and love for Mother Earth and appreciation of its beauty. Encourages spiritual independence by helping one to let go of the need for an external guru.